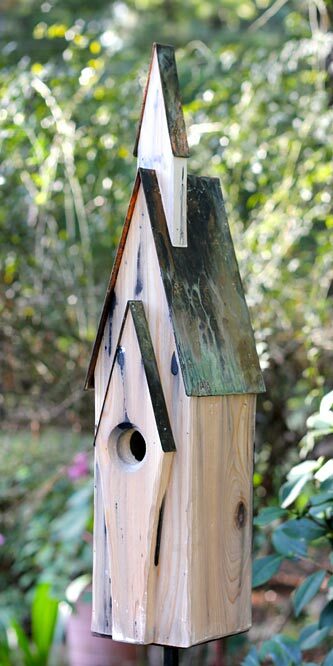 Provide your favorite songbirds with a serene shelter using the Heartwood Weathered White Graceland Bird House. The extended steeple and pitched roof of this home mimic a traditional chapel, and will certainly bring soaring height to your bird garden. The cypress construction forms an enduring abode, and its weathered white finish remains lovely for seasons of service. The lengthy front panel not only adds style to the home; it also extends the 1.5" diameter entry slightly from the rest of the shelter, creating an integrated predator guard. Verdigris flashing tops this panel, protecting the home from rain, and matching the item's generous roof. Ventilation gaps on the sides of the shelter help regulate its internal temperature, preventing nestlings from overheating, and the tall design of the piece offers room for an entire bluebird or wren family. Gaps at the base of the home help any captured water drain, for a dry nest, and a cleanout panel on the back of the unit allows you to remove old nests at the end of each season. Place the flat base of this home on a level surface for a fun display, or attach its back hanger to a tree or post for showcasing it in your garden. The cypress body adds hardiness to this home, and its aged white and soft green hues enhance any setting with ease. Provide your cherished songbirds a lasting and lovely shelter with this Weathered White Graceland Bird House. Made in the USA.